December 8, 2017 5:13 pm. 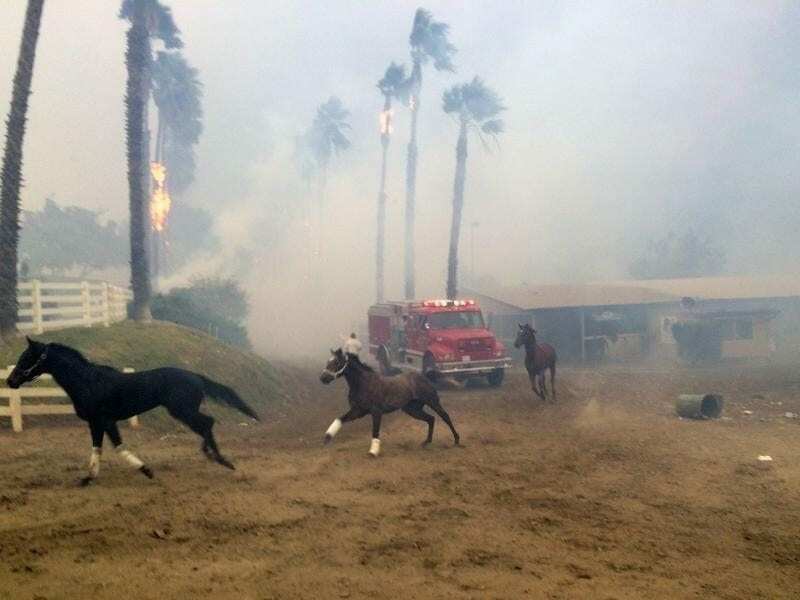 Terrified horses gallop from San Luis Rey Downs as fire sweeps through the horse-training facility. Hundreds of elite thoroughbred racehorses have sprinted away from flames as one of California’s major wildfires tore through a training centre in San Diego County. There was no official count of how many animals were killed in the hazy confusion as both horses and humans evacuated, but trainers at San Luis Rey Downs estimated that at least a dozen had died, possibly far more. Horses worth hundreds of thousands of dollars who are usually carefully walked from place to place were simply set free and encouraged to run away as flames engulfed the track. Mac McBride, who was working with the centre’s trainers, said it was “total pandemonium when several hundred horses were cut loose,” but he believes most of the about 450 horses stabled there survived. McBride, who works at the Del Mar race track, said some horses were evacuated to the nearby track where many of them compete. “There was so much smoke it was difficult to see,” trainer Dan Durham said. San Luis Rey Downs is home to horses that run at nearby Del Mar and other top-flight California tracks like Santa Anita Park. Doug O’Neill, whose horses have won the Kentucky Derby and Breeders’ Cup races, is among the trainers who keep at least part of their stable there. Another trainer Scott Hansen said he knows some of the 30 horses he had at the facility were killed. For now, he said he was concentrating on getting his horses that survived to evacuation centres.